Hope you are well and have had a great week so far. For my blog tonight I thought I'd do a quick review of the meal I've just got home from. 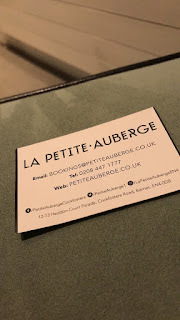 It was a lovely newly opened restaurant local to me in Cockfosters in North London called La Petit Auberge. Theres lots of places to park both outside and across the road from the restaurant which I did note has access for both wheelchairs and also pushchairs as well. This also included from what I could see at the front with enough space to comfortably move around as well. Formally another restaurant I've been past many times and not been in to I have to say for a first impression I was really impressed. The decor and open air design was very welcoming from the moment you entered. From walking past you wouldn't think the area was as big as it was but we were taken to our table towards the back area which looked amazing. With a great big glass sky light / ceiling I can see this being a great area in the summer. The staff were all amazing and our service for a big group on a Wednesday Evening was brilliant I couldn't have faulted any of it. The food was amazing through out all the courses and there wasn't a long wait at all for any of it. 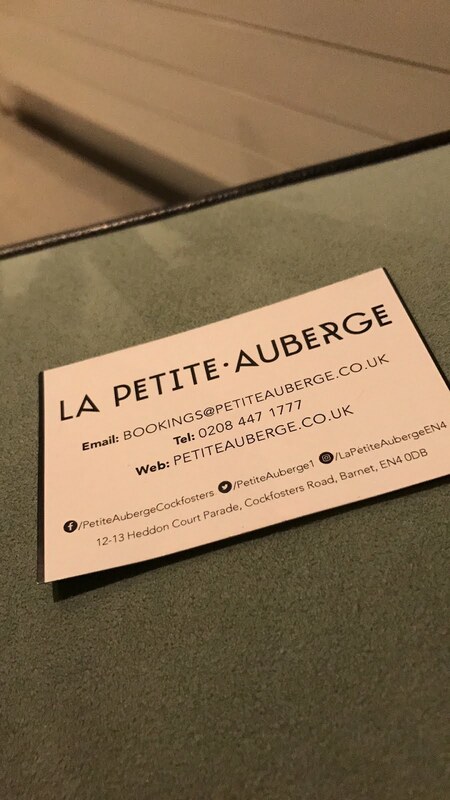 I'd highly recommend a visit to the restaurant and look forward to a returning myself soon.